Hello guys, the heat is on! I am in the mood for writing about my favorite card of all time, so take this article with a grain of salt. 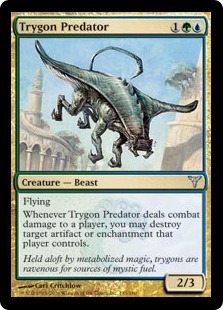 I am slightly biased about what is the coolest / techiest / most insane card in Magic’s history – Survival of the Fittest! Ever since I opened one of these in a pack, I’ve played Survival decks in all formats. I didn’t even know what a “format” was back then, but that sure didn’t stop me. I have so many cool stories about Survival that I could share, but this is not the place to do so. Maybe in another article soon! As I pen this, the reason I chose to write this now is that after a long hibernation caused by the banning of Survival in German Highlander (my favorite format back then), and Legacy a few months later, I had been in a mental state of hoping that one day the cards would be either unbanned in Legacy, or that enough good creatures would enter the realm of Magic that it might have a shot in Vintage. Both cases seemed very unlikely. Nonetheless, in the recent months and weeks, some people tried their best to bring Survival decks to life in Vintage, and that sparked my interest again. If some people were still trying, how could I myself give up? – A blue-based control shell, using Survival for tutoring up solutions, the Vengevine beatdown plan, and general card advantage. – A less controlling and far more aggressive beatdown deck, using Survival for tutoring up the fastest and most efficient threats, the Vengevine beatdown plan, and of course general card advantage. – A fast combo approach, using Survival plus a lot of green mana for a fast Vengevine beatdown plan, the Loyal Retainers + Iona (or Emrakul) combo, as well as access to a few tutorable solutions if need be. – A Hatebears style deck, using Survival for tutoring the best hate creatures against specific strategies, potentially with the Vengevine beatdown route as an alternative. The strongest Hatebear decks I’ve played to date are those that can reliably put down pressure, paired with disruption on the opponent on Turn 1. Speed is important in these type of decks, as you can almost never come back when you fall behind early. The “Bears” available have become quite diverse in how they affect the game, but still I guess that the mana cost and tempo lost by casting an Enchantment first, then tutoring for a specific creature, then casting it, is more than you can stand in this archetype. Additionally, Survival doesn’t have the creature card type benefits of being harder/impossible to counter through Cavern of Souls. So I’d let this idea go to the back of the heap for right now. If I am missing something that would make this theme more viable please let me know. Verdict: Slow card in a strategy that needs speed to compete. Games you are already winning and have time may be “win more,” but overall this may cause less game wins total. 1G (Survival) + GGGG (Discard three Vengevines) + G (Discard Rootwalla to Search Memnite) is basically what you need on turn one or two to pull this off and be 90% sure to win the game. Subtract G when you have a Vengevine in your starting hand or you want to get only 2 Vengevines (which should still be enough to win on the turn after with Rootwalla pumped and Memnite attacking). That’s a total of 1GGGGG at least. Let’s first look at the upsides: this is payable over several turns, as long as the opponent is not threatening to win very fast and/or you can disrupt him. A reasonable way to produce this amount of green mana would be Orcish Lumberjack, which could reliably lead to a turn 3 kill if you’re splashing Red. This also has the benefit of being more powerful against the opposing creature decks, as you can cast Survival on turn 1, and then over the course of next however many turns keep recurring Vengevines to attack with. 1G (Survival) + GG (Tutor Iona, Discard Iona, and Tutor Loyal Retainers) + 2W (Cast Loyal Retainers) will not win you the game immediately, but chances are that you have locked your opponent out of the game from here, by not allowing them to cast meaningful spells of a certain color. This costs 3GGGW, which is one mana more than the Vengevine kill, and has arguably more color requirements by using a second color instead of one more colored mana of the same type. The impact could be greater on the turn you combo off, because Iona is affecting the game immediately. Downsides of the combos: You are vulnerable to every single graveyard hate played in Vintage. As I don’t expect people would bring in huge amounts of hate in general, a Deathrite Shaman or Grafdigger’s Cage, which are both main deck worthy cards in the current metagame, ruin your day completely if you solely focus on this. Apart from that, a single (non-Flusterstorm) counterspell defeats your plan. If you’re really pushing this plan, you’d be running Elvish Spirit Guides and any additional fast mana you could come by (Chrome Mox might be nice), and you’d be stuck with a lot of bad draws without Survival. The white version could play Enlightened Tutor to circumvent too many mulligans for Survival – but still, you’d have far too many dead cards. If you want to play fast combo, Dark Ritual seems much stronger and more consistent. Not as reliant on the graveyard, no need to attack, better protection/disruption options, and an immediate kill. Verdict: Straight up worse than cousins Dark Ritual, Doomsday, Gush, and company. The list that made me think about a competitive Survival deck in Vintage again after many years is one that I’d put into the Beatdown category. Orcish Lumberjack and any type of fast mana usually means 5 mana on turn 2. Playing a Hydra or Dragon on turn 2 is fun for sure, but this exact combination of cards will rarely happen in this deck that fast. You’d want to wait to have a Cavern of Souls ready and possibly Anger in your graveyard (which is really a HUGE card, trust me). What I really like about this list is that it shows the versatility of a Survival deck. Against Workshop decks you can lay down mana guys to produce enough mana to bypass all Sphere effects. Against other creature decks you have the ability to recur Squee and pump out big guys. If you want to lock out the opponent from advancing their gameplan, Magus of the Moon is your friend. Add to this a draw engine whenever Survival comes down thanks to Squee, and a nice toolbox of answers against popular archetypes. This doesn’t rely on the graveyard as heavily, and you can even leverage Grafdigger’s Cage yourself, which is in my view one of the best tools for any Vintage creature strategy against its natural predators Oath and Dredge (Dredge really used to keep “honest” creature decks out of the format, as it was just X times faster and hard to disrupt without the ability to tutor for hate cards or a fast clock). I’m not sure if the Metagame is already slow enough for these beatdown approaches to succeed in big tournaments, but you can bet I’ll give them a shot soon. Verdict: Should be thoroughly explored. In a non-combo-heavy field these seem like a solid choice. Oath of Druids will pop up in your mind about 100 times more often than Survival would, in this context. So why not just play Oath of Druids? Let’s break it down. Oath: 1G (Oath of Druids), and your opponent must have a creature in order to activate Oath. Survival: 1G (Survival) + GGGGG (payable over several turns), and access to your graveyard OR enough countermagic to stay alive until you win via beatdown. Oath: You cannot play any creature cards. You’ll likely need to play Forbidden Orchard. In addition, you will often have 2-3 completely dead draws by accidentally drawing your creatures when you don’t want to, additional Oaths, Memory’s Journey, etc.. Survival: You need to play quite a lot of creatures. You will have 3-4 “bad” draws (Vengevines), but at least they are still hard castable with relative ease. Oath: You can effectively end the game on turn 2 pretty often, especially if your opponent is playing a first turn creature. Survival: You probably won’t ever win before turn 3. Oath: You have several possibilities, ranging from random combo draws (Time Vault + Voltaic Key or Tutor), to riding a planeswalker like Jace to a win. Survival: About everything mentioned above, and you could just beat your opponent to death. Those are the basics, but then again, let’s look at this stuff with respect to different matchups we currently have, to see what it all means in the end. Oath: If you can force through an Oath, you’ll probably win no matter what. 1G + Sphere costs is usually enough to win the game. If you don’t have an Oath, you’re limited to extremely mana-heavy hands that will let you hard cast key cards or a Hurkyl’s Recall. Survival: Survival won’t help you early on, but you have mana producing creatures to accelerate. As you are running creatures, you have more good options against the Workshop opponents, especially after sideboarding. Seems about 50/50 to me. Oath can win much more easily, while Survival should get better tools, and be more reliable. Oath: If you have an Oath + Orchard turn 1 or 2, you put them on a pretty fast clock. They should not be able to win that fast, especially against any of your counterspells. Other hands will often be too slow, especially if the combo opponent has enough disruption of their own. Survival: Fast combo should stomp you if they play it safe. You’ll have to get really lucky with a fast execution or good sideboard. Oath is way better here, as it can put a clock on the opponent with minimal resources invested, and also has more tools to protect against a combo kill from the oppoennt. Oath: Contrary to popular belief, they will have loads of hate against Enchantments or a player Oathing, mostly uncounterable (via Cavern of Souls, or Abrupt Decay). You really want to land Oath in the first or second turn and still have some backup. Survival: You have an engine in Survival, and they don’t. Unfortunately, they’ll use their Oath hate against you. But in the end, you’ll be able to tutor a few times and could just have the bigger creatures in general. 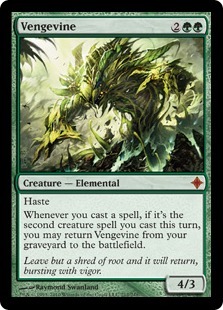 Vengevine is an especially potent card, as even if they deal with it once it will often come back a few turns later. This is a tricky fight for both decks. It strongly depends on the avenue that you are taking with your Survival creatures. I’d call this 50/50 too. Oath: If you can’t tempo them out with a very early Oath + Orchard + Protection, and itwill often get worse and worse as the game progresses if you are unable to land an Oath, as you often give them free creatures to attack with via Orchard tapping for colored mana. They have more draw spells and less dead cards, and often you’ll eventually lose to this card quality issue. I feel that Survival might have the edge here, as it is harder for a control deck to attack it (especially the beatdown route). Oath: They play creatures all by themselves! You just need to land an Oath of Druids, as the kill is not really that fast. You have more counters to win the deciding counterwar on Oath. Survival: It will be hard to win against a resolved Oath, and it will likely resolve due to more good countermagic on their side. Oath should have the upper hand here. Again, you can do a lot to change that equation towards Survival, but from a strategic standpoint, Oath is the natural predator here. So, now that we have worked that out, what do we see? It probably won’t be wise to use Survival in a fast metagame, but that shouldn’t be a surprise. Compared to Oath, Survival is a slower engine that needs fuel to be running, and that fuel is often green mana. Oath needs no further investment, and can win with minimal setup. But Survival has one thing going for it: it will win the game eventually, even without resolving a Survival. Additionally, I cannot imagine a scenario where a Survival over several turns could not win the game, unless you are either completely mana , or you have no creatures available. In that regard, it fits perfectly in a slower control deck, that is not trying to win in a fast fashion anyway. It wants to win efficiently, and that is what Survival does. This single card will win you the game, without any constraints apart from playing creatures, against each and every strategy. I honestly don’t know if this is good enough though. A fast combination win, like Time Vault + Voltaic Key or the occasional Yawgmoth’s Will-fueled turn into too many cards for the opponent to handle, or a Tinker backed up with countermagic are usually the ways that control decks win. You can’t really get more efficient than that. But having the extra route of beatdown is quite intriguing, so let’s give it a try! It is obvious that he wanted to go the combo route quite heavily, but he also included a full playset of Trygon Predators to naturally draw against Workshops and Oath in game 1 (maybe one of the best cards against their deck, if you can land it), Baleful Strixes against everything that wants to attack, and a nice draw engine with Trinket Mage/Skullclamp. 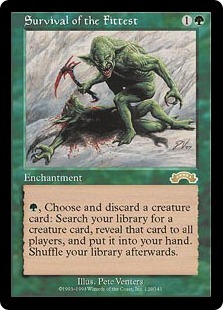 From playing a little bit of Elves in Vintage lately, I know how absurd Skullclamp can be in a deck full of x/1s. Glen Elendra Archmage is the ultimate “seal the deal” against opposing control decks, but I must admit that having 4-5 mana upfront doesn’t make it really nice in my opinion. The same is true for Sower of Temptation. I’d probably want a Gilded Drake over this almost every time. 2GUU to handle a Tinkerbot seems quite costly, and Sower can easily be killed with something like Lightning Bolt. All of these decks seem quite powerful to me. But still the feeling remains that this might not be enough power for Vintage standards. Only time will tell. I’m eager to see where future innovations and printings may take us. Let’s hope for more green enchantments, and may only the fittest survive!